According to BBC News, a low quantity of fossils was unearthed from the last days of the dinosaurs. This makes the unearthing of the Mansourasaurus shahinae the base for setting new and higher expectations for the impetus related to the discoveries to be made. Declares Dr. Veronica Diez Diaz, a member of the Museum fur Naturkunde in Berlin, an expert in sauropod dinosaurs, shocked by the latest discovery made by paleontologists from Mansoura University during an expedition on Egypt. The leader of the expedition, Dr. Hesham Sallam, explains the thrilling moment that represented a climax for the science community, which sets a new beginning with a vast potential for fossil studies. 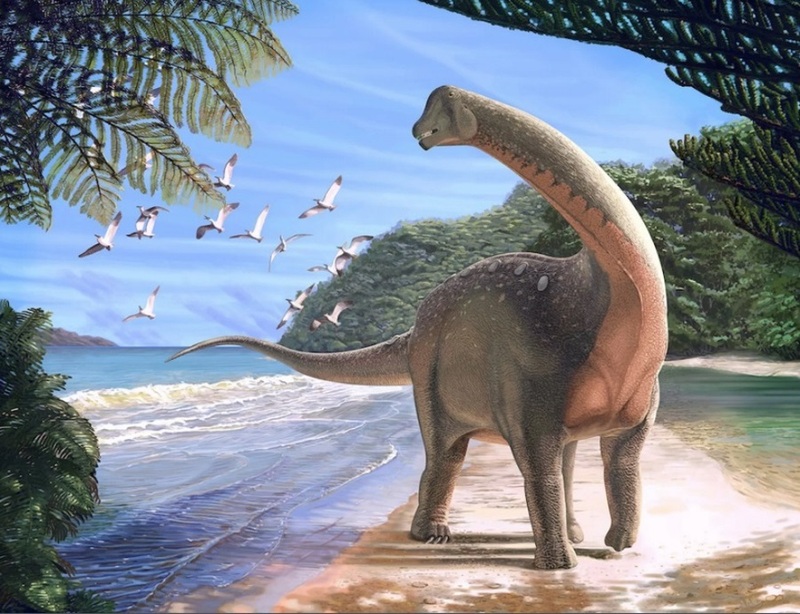 The Mansourasaurus, found in the central area of Egypt, at the Dakhla Oasis, is one of the most complete large vertebrates discovered in a while. The paleontologists managed to recover parts of his osteoderms, back foot, shoulder and forelimb, ribs, lower jaw, neck and vertebrae and parts of its skull. The Mansourasaurus is also an herbivorous dinosaur, which presents a long neck and a long tail, alongside “boasted bony plates” that embedded in its skin, being these bones the osteoderms named above. It is thought to be massive since it was calculated that it had the size of a school bus, about 33 feet (10 meters) long, and had a weight of five and a half tons (5.000 Kg). According to Reuters, the dinosaur is part of a group called titanosaurs. This group gathers the planet’s largest animals found inland ever. The new dinosaur is thought to be 80 million years old, which shocks the world since it is scarce to find dinosaur fossils, from the Late Cretaceous period (100 million to 66 million years ago) in Africa. It is crucial to remember that this was the period that happened just before the famous asteroid crashed into the Earth, killing the nonavian dinosaurs. Live Science explains that the discovery of this dinosaur shows the variety of evolutions that each group presented after the continents were torn apart. And it remained in question how Africa and Europa were connected, and then how Africa and the southern territories were linked as well. The studies related to animal fossils help to develop theories that attempt to solve the question. The researchers explain that if Africa and Europe had connections on the Cretaceous period, the animals would have similar anatomies in the adjacent territories. In opposition to this, if each landmass were completely isolated, the animals in Africa would have different characteristics. Dinosaurs like Mansousaurus shahinae are hard to find since Egypt’s land is covered with dense vegetation that makes it more difficult for paleontologists to find obvious places to dig. An analysis prepared by a lecturer of the Department of Geology at Mansoura University, explains that this new dinosaur found in Africa is more likely to be related to the ones that lived in Europe and Asia than to the ones that lived on the southern areas of its own continent. The new dinosaur, according to Reuters, used to live beside the antique coast that preceded the Mediterranean Sea. The plant-eater discovered by Dr. Hesham Sallam and his students is setting a high bar for expeditions to come. He claims it was terrific for them to uncover each bone alone, that helped them discover the identity of the giant found. Since Africa had a different turn regarding dinosaur evolution, even appearing to have a gap of 30 million years in his late dinosaur kingdom era, the adequately conserved dinosaur was also a “holy grail” for a lot of scientists specialized on the field. The whole study opens new questions, now more specific ones that isolate themselves from the dark void that the Africa fauna used to represent for the scientists that attempted to study them as a kingdom that could be related to other than itself.